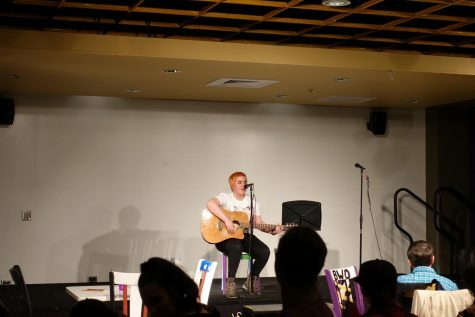 NKU player Cian McDonald scores the winning goal in NKU's come from behind overtime win on Tuesday night. The Norse beat Wright State 4-3 in overtime on September 23, 2014 at NKU Soccer Stadium. After being down 2-0 in the 70th minute, the NKU men’s soccer team stormed back to beat the Wright State Raiders 4-3 in overtime on International Student Night at the NKU Soccer Stadium on Tuesday night. Cian McDonald, a senior midfielder, scored the winning goal in the 92nd minute on a pass assist from freshman forward Jacob Cunningham. However, the ball never went into the net. 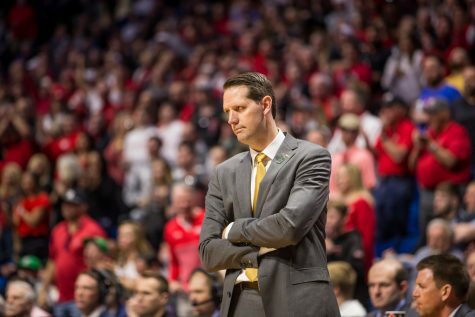 After referee officials conferred, it was determined that the ball was saved by Wright State after it had crossed the goal line, leading to a goal for McDonald. Overtime has become a norm for the men’s soccer team, as this was the Norse’s fifth overtime matchup in the still-early 2014 season. For the first 70 minutes, however, Wright State dominated the match, both offensively and defensively. The Raiders scored first on a corner kick goal by sophomore forward Peguy Negatcha in the second minute of the match. The goal was Negatcha’s third of the season. 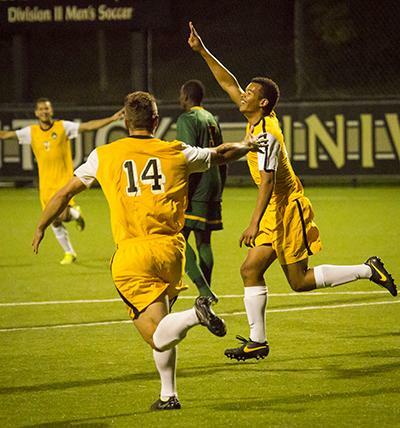 NKU player Kobie Qualah (right) celebrates after scoring his second goal of the night in NKU’s come from behind overtime win on Tuesday night. 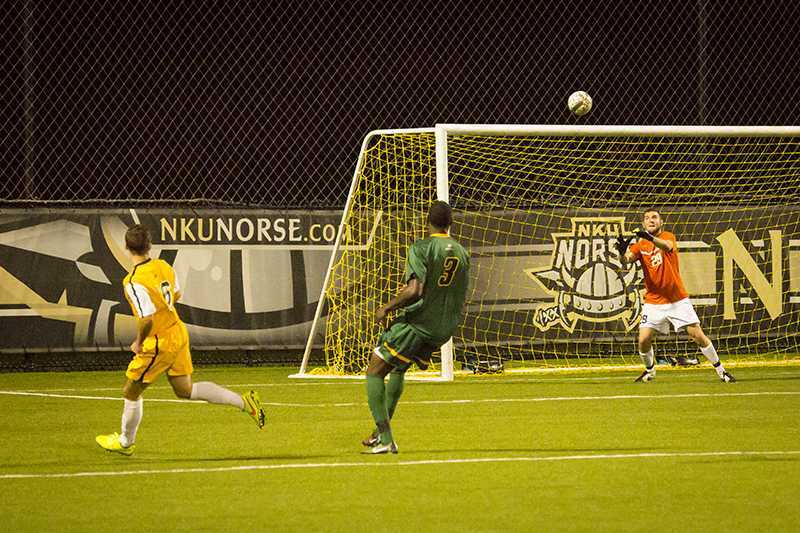 The Norse beat Wright State 4-3 in overtime on September 23, 2014 at NKU Soccer Stadium. Wright State struck again in the 27th minute when sophomore forward Eric Lynch’s shot deflected off the arm of NKU junior goalkeeper AJ Fleak into the net, tying for the team lead in goals with his third of the season. The score at halftime heavily favored the Raiders 2-0. “I told my team at halftime that the next goal was going to decide this game,” Head Coach John Basalyga said. His statement proved to be true. In the 70th minute, the Norse scored their first goal, a shot by NKU forward Kobie Qualah. After getting the ball into the penalty box a handful of times throughout the match to no avail, Qualah collided with Raider goalkeeper Tyler Blackmer and snuck the ball past Blackmer into the goal. 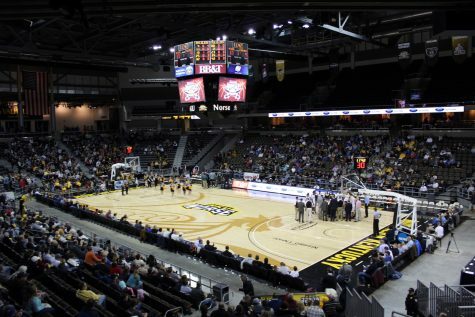 The goal was the first for Qualah in his young NKU career. The goal turned out to be a game changer, as the Norse picked up momentum, being down 2-1. The Raiders wasted no time responding to the Norse goal. In the 72nd minute, Raiders sophomore forward Marquis Payton took advantage of a Norse miscommunication and sailed a shot past Fleak. After allowing the Raiders to take a 3-1 lead, the Norse kicked its playing into the highest gear. Qualah scored an impressive goal, his second of the night, on an assist from Caleb Eastham and Alwin Komolong in the 76th minute, closing the gap between the Raiders and the Norse at 3-2. The Norse tied the match when the Raiders were called for a handball in the 80th minute, allowing McDonald to tie the game on a penalty kick for the Norse. McDonald almost took the lead for the Norse in the 83rd minute as he got past the Raider goalkeeper Blackmer, but a Raider defender blocked McDonald’s shot, leading to a corner kick. The Norse finished the night with seven corner kicks, a feat that was big, according to Basalyga. Basalyga was impressed with the way his team battled back to win the game. “This is probably the best game we’ve played since the transition (to Division I),” Basalyga said. The win sent the Norse’s record to 2-2-3. The Norse will next face Western Michigan in Kalamazoo, Michigan, on Friday Sept 26.